Train travel is surprisingly easy when in Europe. Take for example the Paris to Switzerland’s TGV Lyria. You get to choose from Geneva, Lausanne, Bern, Basel or even Zurich. All departing from Paris. We took the noon train from Paris to Lausanne. The journey lasted a little over three hours. Passing through French towns such as Dijon, Frasne and Vallorbe in Switzerland. Stepping out from the train, we were greeted by the fresh air of the Swiss. Most likely due to psychological rather than real reasons, we felt refreshed. Compared to Paris, Lausanne seemed like a small town. We located the travel information counter who redirected us back to the ticketing counter for our Swiss Pass. As noted earlier in one of my previous posts, the Swiss Pass is by far the most economical ticket during my stay in Switzerland. We saved about CHF450 per person, not inclusive of time that would be wasted on queuing and asking around. After checking into the hotel which was just located opposite the Lausanne train station. We had half a day left to explore Lausanne. Everyone got their walking shoes on as we headed to Fondation de l’Hermitage. 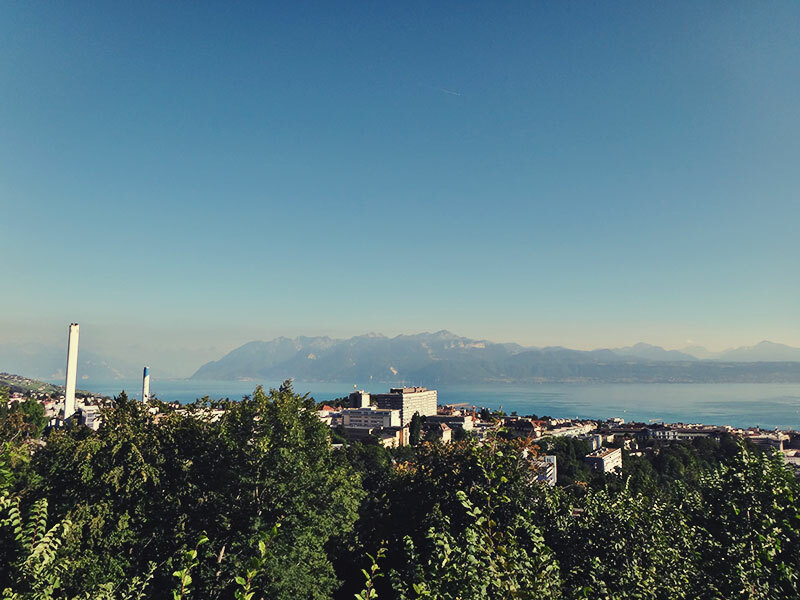 If you had done your research, you would know that Lausanne is situated on a slightly hilly side. That was never more apparent than the steep slope we had to climb to get from the train station level up to the Eglise Saint-François level to catch our #16 Bus. Most of us were panting when we reached the bus stop. We were clearly unfit for such steep walking, which was hardly mind boggling. Back home? For such a distance (800m), we would have driven there. In a car. “They said that the Swiss are very punctual,” quipped QS. “Bam! Yes they are, here is our bus, right on time,” I replied. The Swiss prided themselves over the punctuality of their travel system and within the first hour of our arrival, we were already convinced of the truth. They are unnervingly punctual, right down to the minute. Our destination was located further up among the hills and luckily, we had the bus. There were a couple of twists and turns along the way on narrow roads, all that separates us from the drop was just some medieval wall hugging the cliffside. The Hermitage is located in a secluded wooded area located 200m away from the bus stop. It is basically an art museum and depending on the time of the year, they would host different types of exhibitions but mostly pertaining to the arts. When we were there, it was Joan Miro. Pardon me for my ignorance but I have never heard of him prior to the exhibit. In fact, if it weren’t for the Swiss Pass, which made the admission free, we would have never stepped foot here. Despite all the art history that I took in during the last Europe tour, I still haven’t had an inkling at the subject. Guess I was never meant to be creative. 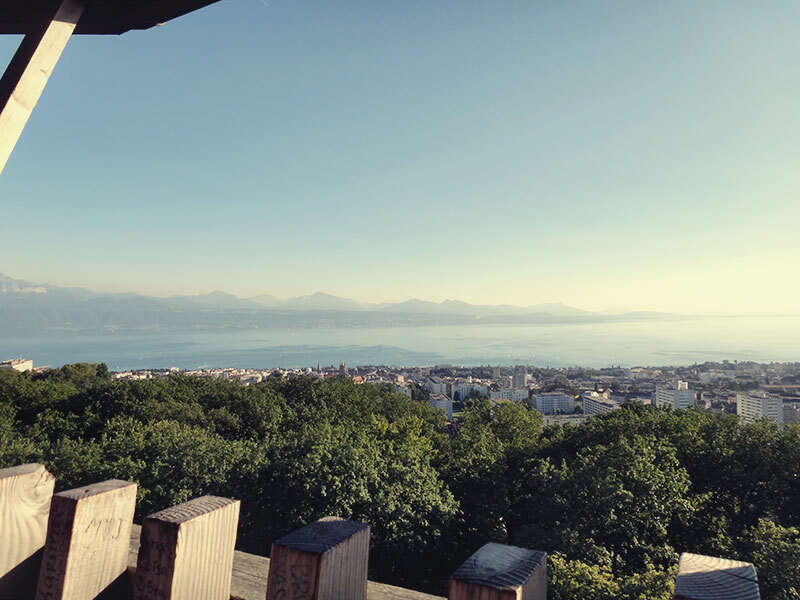 At the back of the building, you will get a better view of Lausanne, although all that you could identify is just the Cathedral and the French Alps across the lake. A quick hike for me but a long walk up the hill for the rest, brought us to the Signal. 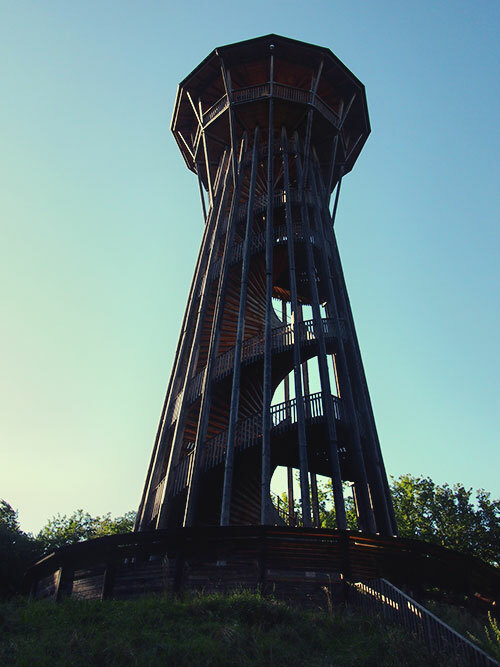 This would be a great stop for those who are not interested in climbing the tower. It is connected by the same #16 Bus and you will get about the same view except a couple of metres lower. It was just the first day (actually the first few hours) and almost everyone was exhausted from the short hike. “You people are really in a bad shape,” I said. “No kidding. What was that?,” Dad asked. “You must be kidding,” added QS. “I guess we will be meeting you guys later after the climb up the tower.” I said. The Tour de Sauvabelin is another 500m away and another short climb uphill. Not to mention the few hundred steps you need to take once you arrived at the place. At least at the top, you are guaranteed a 360-degree view of the surroundings, of which maybe 180 are covered by dense foliage and unidentifiable structures, buildings, apartments and offices. To my surprise, there was a middle-aged woman, jogging up and down the tower. So much for being out of shape, we are comparatively unfit. The highlight of my visit? A daredevil-extreme sports kind of guy was on his bicycle up at the top, and there was a crew of two filming him. He was balancing on the stairs with his bike, jumping up and down. Kudos to him, he sure have the guts to do that. A small distance away between the tower and the lake, lies a free petting zoo, usually for those with kids and families. There is a sandpit and a setup for a playground. the lake itself was actually a small pond, in which you could rent a paddle boat and go paddling. But between you and me, I would prefer paddling on the Ouchy waterfront. One of the best thing about the Swiss punctuality is that you could plan your day right down to the dot. For instance, today’s trip, as long as I show myself at Lac Sauvabelin at the specific time, I will certainly find myself a bus to take me back to where I wanted to go. So we didn’t have to rush or waste our time waiting at the bus stop, searched the SBB website, download the times and just enjoy!